I really like The Pioneer Woman - having said that though, I'd never tried making any of her recipes until last night. I borrowed her cookbook from my Aunt awhile back and I've flipped through it so much, I'm probably going to have to just go buy my own copy! Her blog is so cool - or whatever term would be appropriate for one lady to say to another lady, haha. I could spend hours on there reading entries. 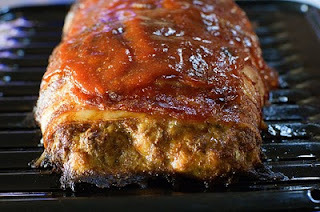 Anyway, enough hero worship...I made her recipe for Meatloaf and it turned out pretty well. I did do a few substitutions - I didn't add hot sauce because we're not really a fan of it and I added chopped parsley flakes instead of fresh parsley. The bacon really makes this dish pop but we did think the meat mixture was a bit bland - so next time I may add some more seasoned salt or perhaps try some Italian seasoning. Otherwise, it was really tasty! I'm going to try some of her other recipes out over the next month or so - I'll let you know how they turn out! Newest follower- Oh my goodness, that looks delicious. It must be dinner time soon. (ha ha) Better start cooking!